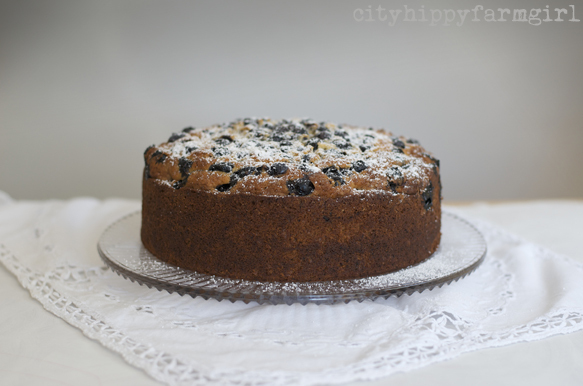 Blueberry Cake and how did two happen? she turned two, and I’m not sure how that happened. I still think of the afternoon light and the peaceful way she swam into this world. Turning two meant there was birthday cake with her favourite, favourite “blues”. 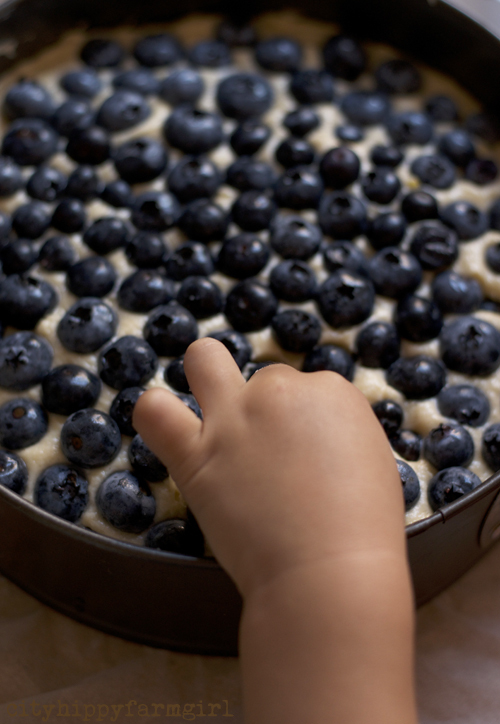 one blueberry in the mouth and one for the cake. There was a doll- the most beautiful doll you ever did see. A Little Vintage Store, is where the lovely doll is from. Beautifully handmade by Jennie in Brisbane, Australia- I’m in awe I really am. Love, love, love that this birthday present didn’t come from a department store with a ‘made in china’ tag. Cream the butter and sugar together, add vanilla, eggs, lemon zest and milk. Then fold through flour. 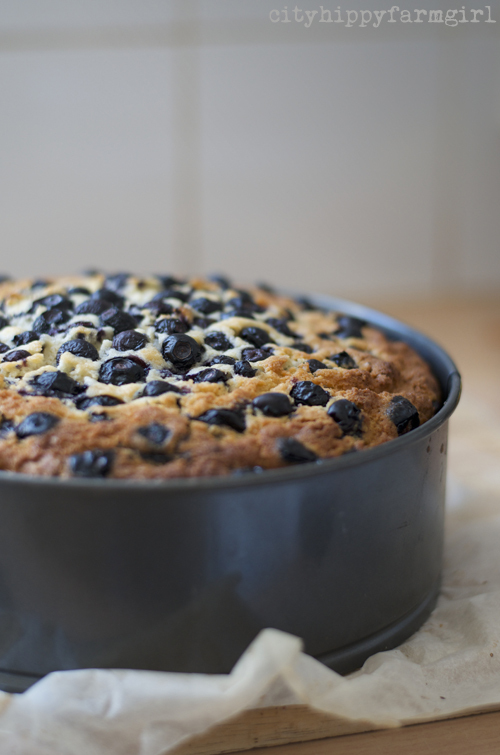 Into a greased and lined tin and arrange blueberries. Bake until golden at 180C. This entry was posted in Food Glorious Food, Rambles, Waffles and Digressions and tagged a little vintage store, birthday cake, blueberries, blueberry cake, children's birthday, doll, handmade, simple by cityhippyfarmgirl. Bookmark the permalink. Happy birthday, baby girl!! Wow, that’s gone quickly, Brydie, seems like only yesterday you were pregnant! 🙂 Beautiful cake, and absolutely stunning doll! This is a beautiful post. So sweet, especially the photograph of her little hand reaching for a blue. Lovely cake. I had to be fast. Very fast! (She is very skilled at jamming as many ‘blues’ in as possible. I think they will always be too Jane…even when they are 60. You are right, every age has it’s own kind of magic. I did first day of Kindergarten again this year too…gulp. No easier the second time round oddly enough. Enjoy that precious family time CL. Every second of it. Bless her cute little hand! 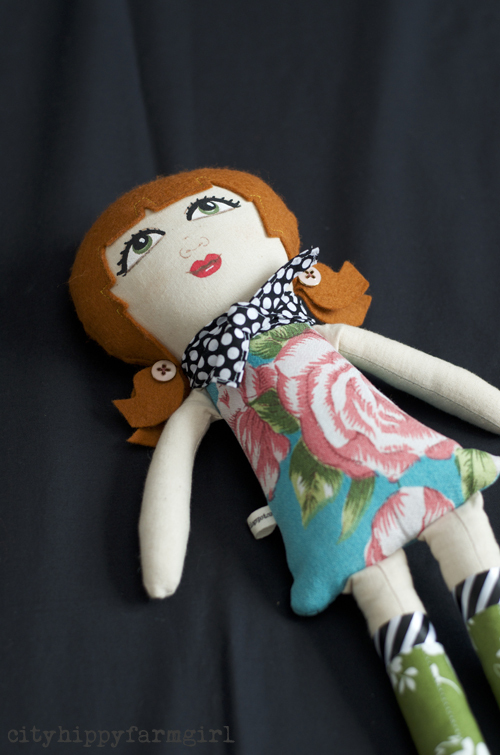 So lucky to get such a beautifully hand made and one of kind doll. Girls always remember their favourite dolls from childhood; some lucky to still have them later in life. Perfect cake! Beautiful post. My little boy turned 2 this week as well and I’m having the exact same feeling – when did this happen?! Gorgeous cake and photos as well. Oh just goes way too fast! Just wish we could freeze time! Gorgeous cake! While I’m in no hurry for my children to grow up I do look forward to that day of sitting round a table and sharing pots of tea. I do love that imagery. Loving that she got a “healthy” birthday cake – my little babe had chocolate beet cake for her first. She also loves her berries. And does that doll have flowered Wellies on? Too cute! And I also very much like that it was not made in China. I LOVE that it’s not made in China Katie! Birthday Blues! So gorgeous Brydie. Awww that little chubby hand… 2-year old’s hands are just the best; so spongy and pudgy and edible! Can’t even begin to tell you how much I LOVE that doll, with her neckerchief, boots and funky dress. Divine. My first doll was home-made too, and I’ve never forgotten it. PS. Lovely, lovely cake. Wouldn’t mind a slice right about now. It’s the cutest little thing isn’t. We are so lucky to live in this digital age, in that we are exposed to so many artists and creative people. Buying a plastic Disney doll from a department store…yep, no need, and I love that. Ooh eek, hope you can see them now?! Yes, I can now – gorgeous! Thanks Johanna, I wonder if there are ever, ever any kids that don’t like lollies…I wonder?